It is entirely possible that no single automobile has, upon its introduction, upended a deeply established category as decisively as the first Lexus LS did when it launched the luxury brand 28 years ago. The original luxury disruptor, the Lexus LS has for nearly three decades set benchmarks for powertrain smoothness, ride quietness, craftsmanship, attention to detail, documented dependability and long-term quality. The Lexus brand supported that groundbreaking vehicle by setting and maintaining new standards for customer experience and satisfaction. Now, Lexus is repeating history with the introduction of the all-new, fifth-generation LS flagship sedan for 2018. Inside and out, the new LS reflects a strong, uniquely Japanese identity and approach to luxury and offers innovative technology with a human touch. Yet the all-new LS was designed to be the brand’s latest global citizen, available in over 90 countries. Longer and lower than the model it replaces, the all-new LS debuts a strikingly sleek and bold design with a coupe-like silhouette punctuated by the unique Lexus design language. A new driver-centric performance feel stems from building the LS on the company’s all-new global architecture for luxury vehicles (GA?L). This premium rear-wheel drive platform, an offers a more dynamic driving experience while further elevating renowned Lexus comfort. The original Lexus LS won acclaim by anticipating what luxury customers would want, rather than by simply amplifying what established luxury automobile brands offered at the time. In that spirit, the 2018 LS sedan’s spacious cabin, unique appointments, and visionary technology will once again surprise customers by resetting expectations for a global flagship sedan. The original LS launched the Lexus brand and the all-new 2018 LS advances the brand’s more dynamic direction. Each generation of LS sedan leading up to the all-new 2018 iteration has elevated the state of luxury, craftsmanship, performance and safety in its own way. To create the 2018 LS, Lexus took the approach of starting from new, reimagining what a flagship sedan should be, as if launching the brand once again. The goal was not to just improve on what Lexus had done, but to exceed expectations of global luxury customers. A common thread through all LS models remains: Omotenashi, the concept of Japanese hospitality. Applied to a luxury automobile, it means adopting a human-focused approach to the vehicle: taking care of the driver and passengers, anticipating their needs, attending to their comfort and helping to protect them from hazards. 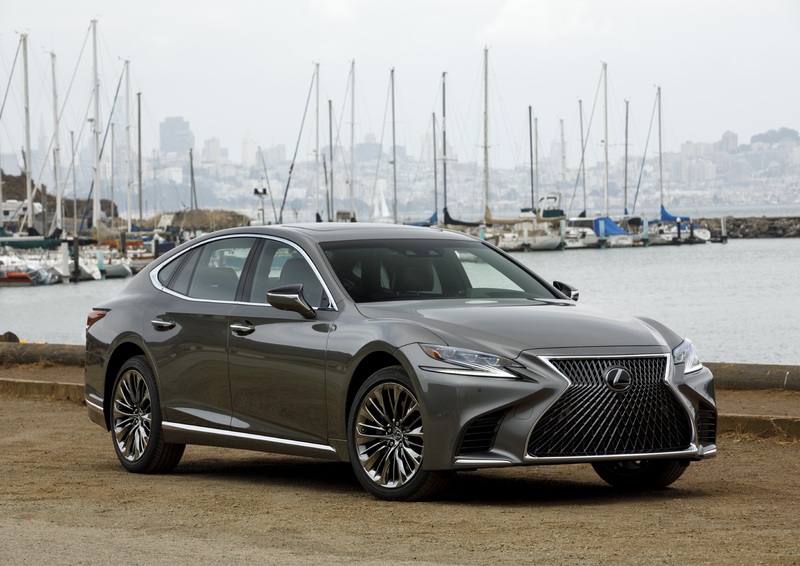 Lexus designers took full advantage of the new platform, with its lower profile and length on par with that of a prestige long-wheelbase sedan, to give the new LS a stretched, ground-hugging appearance. Compared to the outgoing LS, the new model is about 0.6 inches lower, while the hood and trunk are approximately 1.2 inches and 1.6 inches lower, respectively. Following the “Yet” philosophy that has been passed on since the first-generation LS, Lexus created a design offering the room and comfort of a prestige “three-box” sedan, yet with the more striking coupe-like silhouette that holds stronger appeal for many of today’s luxury customers. The new LS is also the first Lexus sedan with a six-window profile, which enables excellent outward visibility. A first for a Lexus sedan, the flush-surface windows smoothly integrate with the side pillar. The unique rendition of the spindle grille mesh, with a texture that seemingly changes in changing light, is the result of both intense CAD development and hand-adjusting thousands of individual surfaces. Flanking the unique grille, the narrow slit-like 3-projector lamp merges with an L-shaped LED lamp that wraps broadly around to the side to give the front of the LS a resolute gaze. The coupe-like silhouette is not due solely to the fastback roof style. Maximizing the GA?L platform’s low form, the pillars of the cabin taper from the central position of the occupants. Together with the contrast between the pulled-in doors and the front and rear fenders that flare away from the central position of the occupants, this creates a dynamic form. A front to the rear shoulder line gives the vehicle’s basic posture a low stance with a horizontal axis and a bold appearance. Additionally, the axes of the dramatically flared front and rear fenders are slanted forwards, creating a dynamic impression that evokes driving performance. An outer slide-type moonroof preserves headroom with the lower roofline. The 2018 LS debuts two new 19-inch wheel designs and three 20-inch wheel designs, two of which are also new. The 20-inch premium wheels employ a brilliant appearance created using an electroplating technique known as sputtering. All but one (F SPORT) of the new wheel designs feature a hollow rim structure that helps reduce resonant sounds generated by the tires. More than ever before, luxury sedan drivers demand greater handling agility and performance feel, but without sacrificing comfort. It’s one of the most difficult balances to achieve in a vehicle, yet the new Lexus GA–L platform easily meets this challenge. The GA-L platform is the stiffest in Lexus history, setting the stage for enhanced handling, ride smoothness and cabin quietness. The 123-inch wheelbase is 1.3-inch longer than the outgoing LS long-wheelbase model. The new wide and low LS design optimizes the center of gravity and weight distribution. Helping to provide the uncanny ride and handling balance in the new LS is the latest generation of a chassis control technology: Vehicle Dynamics Integrated Management (VDIM), which was first introduced in 2005. This system implements cooperative control of all available vehicle subsystems— ABS, Traction Control (TRAC/TRC), Vehicle Stability Control (VSC) and Electric Power Steering (EPS), Variable Gear Ratio Steering (VGRS) and Dynamic Rear Steering (DRS)—to control basic longitudinal, lateral and vertical motion as well as yaw, roll and pitch. The all-new GA-L vehicle architecture that underpins the LS is the result of a completely new approach to engineering, materials and loads of the vehicle structure. Rather than starting from existing vehicle platform and then figuring out how to modify it to fit the LS’ shape and strengthen it to support contemporary chassis dynamics, Lexus engineers literally started with a clean sheet of paper – a blank CAD screen– in designing the new structure. Examples of this can be easily seen underhood, where new cast-aluminum suspension towers that support the upper spring seats and suspension mounts are visible above each front wheel. Since aluminum and steel can’t be welded together with conventional techniques, the joint attaching the aluminum tower casting to the steel body structure is made with self-piercing rivets and high-strength adhesive bonding; similar processes are used to secure the aluminum rear suspension towers to the body structure behind the back seats. Compared to structures with similar capabilities in steel, this technology is 42 percent lighter at the front; in the rear the aluminum structure has 1.5 times the rigidity of steel with 50 percent less weight. In creating the new LS, engineers used lightweight materials including ultra-high tensile hot stamped steel and other steel alloys in critical areas with tensile strengths from 590 up to 1180 MPa and aluminum. The 2018 LS has a high tensile steel mass composition of nearly 30 percent, which is more than double what was present in the previous-generation LS (14.1 percent). Critical to its driving performance, the new platform lowers the vehicle’s center of gravity by placing most of its mass, including the engine and the occupants in positions more centralized and lower in the chassis. Special braces in the engine compartment, stiff aluminum front and rear suspension towers, and other features help bolster the strength of key chassis structures. LS models have long set benchmarks for suspension compliance, yet even here Lexus saw opportunity for further gains. For example, the all-new multilink front suspension employs double ball joints on the upper and lower control arms to help allow for control of the smallest movements from the driver inputs and road conditions. This unique dual-ball joint arrangement optimizes suspension geometry to increase wheel control and yield more precise steering response with better initial effort. To reduce unsprung weight and aid agility and comfort, aluminum is used extensively in the suspension. Like the previous LS, the all-new model offers an available air suspension system that further refines the already sublime ride quality. A new, more advanced version of Adaptive Variable Suspension (AVS) continually adjusts damping control in response to driving operations and road surface conditions. “Continually” is the key word, because Lexus increased the damping-force switching levels from the previous model’s nine to 650 in the 2018 LS. The result is faster, more seamless and refined operation. The new AVS system effectively provides both shock isolation and a flat ride even on road surfaces with large undulations as well as small, rough areas. The result is enhanced steering response and stability along with greater ride comfort. As a real-world example, when driving an AVS-equipped 2018 LS in an urban setting over a rough surface, the system can increase ride comfort without increasing damping force too much. Yet, when the steering wheel is turned, damping force increases to suppress unwanted weight transfer and preserve flat cornering. For high power, scintillating performance and excellent fuel efficiency, Lexus designed an all-new 60-degree 3.5-liter V6 engine specifically for the new LS. This engine has an undersquare design for improved thermal efficiency coupled with twin turbochargers, and has benefitted from the company’s F1 technology. This new LS engine is indicative of the more dynamic approach being taken by Lexus, offering V8-level power in a more compact package with efficiency and refinement. The new LS engine offers the output one would expect in a flagship sedan: 416 horsepower and 442 lb-ft of torque, significant gains over the outgoing LS model’s naturally aspirated 4.6-liter V8 (386 hp and 367 lb-ft). The engine’s long stroke, optimized 0.86 bore-to-stroke ratio, increased valve angle, straight intake ports and laser-clad intake valve seats developed using performance simulations based on F1 technology combine to yield world top-level high-speed combustion technology and thermal efficiency. The twin turbochargers were designed and produced in-house to control tolerances and quality. They achieve top-level mechanical efficiency by improving exhaust energy recovery using a curved turbine blade shape and increased blade length, along with die-cast compressor housings and improved surface precision. Electric wastegates provide ultra-precise turbo boost control for seamless, lag-free power buildup. The intercoolers are cooled by engine coolant for higher performance and efficiency. A special version of Lexus’ D-4S gasoline direct injection plus port injection system was developed to improve injection control linked to turbocharger operation. Called D-4ST, this system controls new six hole direct injectors and the port fuel injectors to take advantage of the turbochargers and the high tumble ratio of the engine. Twin water-to-air intercoolers reduce the temperature of air pressurized by turbocharging. The intercoolers are mounted on top of the engine, each in a direct path between its turbocharger and intake throttle to reduce volume and lag in the intake tract. Remarkable powertrain smoothness, a Lexus hallmark, begins deep inside the cylinder block, where a ladder frame support for the crankshaft main bearings adds rigidity for low vibration. Redesigned engine mounts, the electric wastegates and numerous other features also contribute to the engine’s ultra-smooth demeanor. In RWD form, the new LS 500 sees a 0-60 time of 4.6 seconds. Perhaps more critical to driving enjoyment, though, is how Lexus tuned the engine and transmission to deliver instant acceleration and a constant buildup of torque toward the engine’s redline. The driver can tailor powertrain response and feel by choosing from Normal, Sport S or Sport S+ modes. Just enough of the exhaust note can be heard to enhance the car’s dynamic nature. The first-ever 10-speed automatic transmission for a premium passenger car, having debuted in the Lexus LC 500, is now also used in the new LS 500 gas models. It is a torque converter automatic, yet with shift times that rival those of dual-clutch transmissions. The wide bandwidth afforded by 10 closely spaced ratios is ideal for all driving situations. Using aluminum for the clutch drum, clutch hub and planetary carrier reduce rotating mass; coupled with shortened internal oil passages and smaller, faster shift solenoids results in quicker shifts. These improvements, plus a resin plastic transmission oil pan, yield a 10-speed transmission weighing the same as the previous 8-speed gearbox. The LS features steering wheel shifter paddles. However, even drivers who might enjoy controlling gearshifts manually will be duly impressed by the automatic mode’s advanced electronic control system. The artificial intelligence transmission logic (AI-Shift Control) anticipates the driver’s input by monitoring acceleration, braking and lateral-g forces to execute perfectly timed, ultra-quick shifts. For starting acceleration, the close ratios of the low gears and the short shift times enable a rhythmical and exhilarating acceleration feel. The high torque of the twin-turbo engine matches ideally with the higher gear ratios for effortless, serene highway cruising, yet very quick downshifts yield direct acceleration with no lag in G response. To provide a direct feel, while also supporting fuel efficiency, torque converter lock-up activates in all ranges except when starting off. The 2018 LS Hybrid takes an entirely different approach than the previous LS Hybrid model. The new Multi Stage Hybrid System, which debuted in the LC 500h Coupe, combines a naturally aspirated Atkinson-cycle 3.5-liter V6 gasoline engine with two electric motor/generators and uses a compact, lightweight lithium-ion battery. D-4S direct fuel injection and lightweight valvetrain components allow a 6,600-rpm redline, with Dual Variable Valve Timing with Intelligence (Dual VVT-i) ensuring ample torque across the engine speed range. Combined system output of the internal combustion engine with the electric traction system is 354 hp, enabling the LS 500h to accelerate from 0-60 mph in 5.1 seconds (RWD). The new system is based on the electronically controlled planetary continuously variable transmission of Lexus Hybrid Synergy Drive coupled to an all-new four-speed automatic gear set at the output stage. The two systems work together to expand the overall range of gearing and increase operation of the V6 engine across a wider speed range than previous hybrids. In M mode, the two gearsets are controlled together to provide the effect of 10 ratios, giving the LS 500h a highly engaging driving feel and allowing the driver to shift through the ratios with paddle shifters. And with a 22.2-gallon fuel tank and 25/33/28 (city/highway/combined) manufacturer-estimated fuel economy, the LS 500h RWD has a range of over 600 miles, depending on driving conditions and habits. Creating a new standard of flagship luxury is not simply a matter of adding more features and technology. Inspired by the omotenashi principle, Lexus sought to instill the new LS cabin with luxury that welcomes and envelops passengers while treating the driver like a partner. New seating designs include available 28-way power adjustable front seats. Combining electric motors with a new pneumatic control system allows fine adjustment of the entire seat with minimal weight and bulk. In the rear seats, two dedicated heaters—located in the shoulder and lower back areas of the seat—warm these specific areas without warming a person’s entire body. The organically shaped dash design clusters information displays at a uniform height to support the “seat-in-control” layout that emphasizes the driver’s ability to operate all systems without changing body posture. The 2018 LS 500 offers a choice of nine interior color schemes, plus two for the F SPORT (Black and Circuit Red). In addition, nine choices in interior trim are available, including the exclusive Naguri-style aluminum for the F SPORT. Inspired by Shimamoku wood patterns, the new forms that combine the artistic combination of natural woodwork and application of Japan’s sophisticated sliced wood and laser-cutting manufacturing technologies are used for the new LS. New patterns, including Art Wood Organic, Art Wood Herringbone and Laser Special Matte feature bolder contrasts between light and dark, giving the wood a more vibrant appearance. Art Wood Organic was inspired by a “blazing fire”, and took over a year to create. By layering the wood and applying a natural gloss coating to enhance the vibrancy of the grain, the resulting pattern gives the impression of a flickering flame. Art Wood Herringbone features wood mosaic craftsmanship similar to that used for decorating musical instruments. Natural wood pieces are individually handcrafted by a Takumi craftsperson to create a delicate, Lexus-original mosaic, with an L-motif pattern subtly blended into the herringbone design. To create the Laser Cut Special wood trim, a cutting and forming technology is utilized to expose beautiful metal lines beneath the natural wood veneer that can be seen and felt. The striking cut glass ornamentation – a world first in a production vehicle – draws inspiration from Japanese Kiriko glassware. Traditional Kiriko patterns are created using a technique that involves hand-cutting clear colors and delicate lines in a piece of glass, which are then repeatedly polished to a soft glow. For the 2018 LS, Kiriko master craftsmen worked closely with Lexus designers and engineers to duplicate the hand-carved appearance of Kiriko glass using leading-edge laser data copying and polishing technology. For those not choosing the Executive Package, the look of the Kiriko glass pattern ornamentation has been adopted for the display zone in front of the passenger seat. The hand-pleated upholstery is produced using a process that took four years to develop—and that can be done only by human hands. A single cloth sheet is folded like origami paper, each fold carefully overlapped with the next, creating a dramatic pleated effect. The effect of the light and the three-dimensional upholstery creates an elegant space that envelops the occupants. Integrated into the LS 500’s cabin is the next-generation Remote Touch Interface (RTI), designed to mimic smartphone operation and supporting handwritten input. In addition to its 12.3-inch wide navigation display, the LS can incorporate an optional 24-inch color heads-up display (HUD)—currently the largest in the world—that projects a variety of information onto the driver’s forward view. While making the new LS even more of a driver’s car, Lexus also optimized the LS as a car to be driven in, lavishing considerable attention to the rear seat. The rear cabin design creates seamless, enveloping continuity between the trim and seatbacks for passenger egress. Options for heating, and massage make the rear seat a welcoming environment. The available power front and rear seat with Shiatsu massage and a raised ottoman, part of the Executive Package, offers more legroom than any previous-generation LS (3.4 in. more than the outgoing model). In addition, the seat behind the front passenger in this optional package can be reclined up to 48 degrees (largest angle in the segment), and can be raised up to 24 degrees to assist the rear-seat passenger exiting the vehicle. Available rear “Relaxation Seats” with a warming function use air bladders integrated into the seatback and seat cushion. These are inflated to strategically apply pressure to the occupant’s body, while also applying warmth to the shoulder and lower back areas. The occupant can select from three full-body programs (“Refresh”, “Stretch” and “Simple”) and four that target specific areas (“Upper Body”, “Lower Body”, “Shoulder”,” and “Lumbar”). Because the new LS is lower than previous versions, Lexus for the first time equipped the available air suspension with an access function. Activated by unlocking the car with the smart key, access mode automatically raises the vehicle and widens the seat bolsters to welcome drivers behind the wheel. Within the Lexus line, the “F” models, including GS F and RC F, are the track-tuned maximum-performance machines. The F SPORT versions, including the new LS 500 F SPORT RWD, instill a more engaging driving spirit through carefully applied chassis tuning and enhancements, while still emphasizing exceptional comfort. Lexus took full advantage of the new GA–L platform’s inherent driving agility when developing the 2018 F SPORT package. Handling enhancements via the latest iteration of the VDIM system allows for integrated management of these chassis dynamics as a single system. Optimal control of these motions enables exceptional ride comfort, enhancing traction, safety and handling agility. VDIM is capable of aiding stability when the car is traversing split-friction surfaces, such as dry pavement with ice. More of the GA-L platform’s intrinsic performance capability is unlocked via exclusive 20-inch alloy wheels with 245/45RF20 front and 275/40RF20 rear tires in either summer performance or all-season compounds. In addition, larger front and rear brakes — six-piston aluminum monoblock calipers on front around two-piece ventilated spiral-fin iron rotors 15.7 inches (400 mm) in diameter by 1.4 inches (36 mm) wide and four-piston calipers on 14.1 inches (359 mm) by 1.2 inches (30 mm) ventilated spiral-fin rotors in the rear, all with high-friction brake pads—serve to drive the car’s dynamic message home. The available Performance Package on gas F SPORT models adds Variable Gear Ratio Steering (VGRS) system, Active Rear Steering and Active Stabilizer. The result is a full-size premium luxury sedan that responds more like a sports coupe through curves, without sacrificing renowned Lexus ride comfort. The 2018 LS 500 F SPORT stands out, but doesn’t shout. It essentially “turns up the volume” of the new LS design, so to speak, without distorting the fidelity. An exclusive version of the spindle grille shows even greater intricacy in the design – and the brand’s obsessive attention to details. CAD operators spent five months developing the F SPORT grille to achieve the desired texture and interaction with light. Even then, they adjusted nearly 7,000 individual surfaces to achieve the desired look and texture (compared to 5,000 for the standard model’s grille). Special F SPORT rocker moldings along with the aforementioned 20-inch wheels accentuate the rakish LS profile. Lexus infused the F SPORT persona throughout the cabin, starting with the perforated-grill pattern on seating surfaces and Naguri aluminum trim elements. F SPORT 28-way electric/pneumatic seats with cushion length extenders brace occupants when driving through curves, ensure exceptional comfort no matter how long or brief the drive. The driver faces a special F SPORT speedometer and tachometer in a movable meter with a meter ring that slides to display information, an iconic design adapted from the limited-production Lexus LFA supercar. Attention to detail shows in the aluminum accelerator pedal and F SPORT shift handle, and footrest. The crowning touch is an Ultrasuede headliner. Lexus tuned the LS exhaust to convey a more authoritative tone, yet also designed the cabin to ensure utterly quiet cruising. New sound suppression methods further hush the environment compared even to the super-quiet previous LS models. Active Noise Control quiets the cabin even more by detecting the sound of the engine coming into the vehicle and cancelling certain frequencies using antiphase sound from the audio speakers. The serenity of the LS cabin provides an ideal stage for the standard premium audio system or the new audiophile-worthy available 3D surround Mark Levinson QLI Reference Surround Sound System. Employing Quantum Logic Immersion technology (QLI), Clari-Fi music restoration technology and 23 speakers in 16 locations throughout the car (including the rear ceiling), and a 16-channel Mark Levinson Reference Amplifier producing the equivalent of 2400 watts with 0.05 percent Total Harmonic Distortion (THD) it offers an audio experience unparalleled in any Lexus. Lexus safety features are developed based on the Integrated Safety Management Concept to make each driver better. The concept focuses on analyzing and optimizing safety technologies for four main causes of traffic fatalities: accidents related to pedestrians, vehicle departures from roads, intersections, and rear-end collisions. “The LS is designed to be the top runner in advanced safety technologies,” said Lexus LS Chief Engineer Asahi. The all-new Lexus LS provides world-class safety technology through the combination of two advanced Lexus safety systems, Lexus Safety System+ and Lexus Safety System+ A (Advanced) Package, which are ultimately aimed at reducing traffic fatalities. Lexus Safety System+ comes standard on the LS. Lexus Safety System+ A offers additional equipment and is available as an option. Both systems, in addition to other technologies, support more secure driving in a broad range of situations, providing the driver with information ranging from support status notifications to information on vehicle behavior during safety feature operation via the multi-information display and, when equipped, the large color heads-up display (HUD).